The Primary Program, for age group three to six years old, is carefully designed for children to “learn by doing.” It is a calm, structured space constructed to meet a child’s individual needs. Here, your child experiences a blend of freedom and discipline in a space especially designed for his or her optimal development. During these formative years the social, physical, and intellectual functioning of the child is unified. The most important function of the Primary program is to provide children with an early and general foundation that includes a positive attitude towards school, inner security, and a sense of order. That foundation goes on to include pride in the physical environment, abiding curiosity, habits of concentration, initiative and persistence, the ability to make decisions, self-discipline, and a sense of responsibility to other members of the class, school and community. This foundation enables them to acquire more specialized knowledge and skills throughout their school career. Sensorial – Through the sensorial area, the child is given the facilities to make clear concepts and classifications for all the information she has gathered thus far through her sensory perceptions. The sensorial materials help to order the child’s mind by isolating and emphasizing one quality at a time (i.e. size, gradation). Through the physical manipulation of materials in this area, the child begins to categorize and order the objects in their world, leading to increased understanding of their role in the universe. Language – Language exercises are offered to the child initially as an aid to the child’s own developmental process for language. By age 3, the child has already mastered basic spoken language. 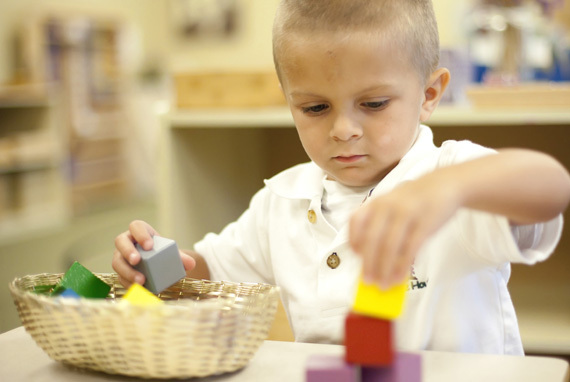 When the child enters the Primary Montessori classroom, the materials of language offered to the child will simply add to the foundation the child has already made through self construction. During the primary cycle, she will go through three stages of language: expansion of vocabulary, writing, and reading. Mathematics – By nature, everyone is mathematical. We are all born with a mathematical mind, which isn’t something that we create, but something we need to awaken it into consciousness. Through exercises offered to the child, the child prepares for the emergence of the mathematical mind that exists within him. Cultural Activities – Cultural areas include art, biology, geography, history, music, science and foreign language. In the primary program, children will be exposed to these cultural activities within the realm of their prepared environment.